In Iran, Damask roses usually grow in high-altitude (2000-3000 meter above sea level) and dry regions; and they are mainly produced in Isfahan (particularly in Kashan city), Kerman, Kermanshah, Fars, and East Azarbaijan provinces. This valuable plant has long been known for its medicinal properties and unique fragrant smell. Hippocrates, the great Greek physician, prescribed it for abdominal pains, earache, toothache, common cold, influenza, coryza, acute bronchitis, and wound healing. This herbal tea is used to treat mouth ulcers, headache, sore throat, fever, insomnia, and nausea. Damask roses can boost heart and lung function and bolster the immune system against malignant diseases. It can also reduce inflammation like a sedative, especially for joint pain. 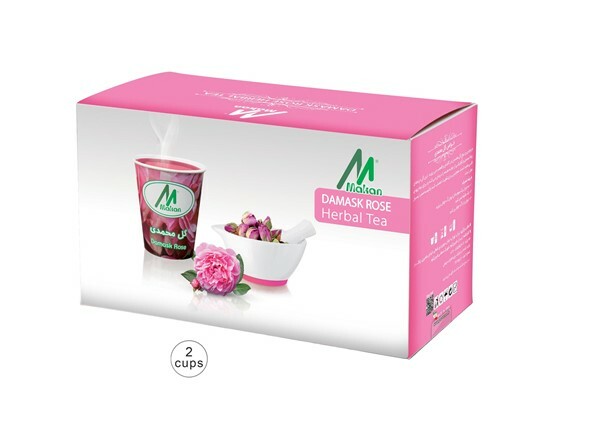 A new genius idea is to fix Damask rose pods in the bottom of paper cups, making it possible to prepare a delicious and healthy herbal tea in just a minute. These environment-friendly flavored tea cups are recyclable, and can save up time and energy.